Description: Rectangular shape, rounded corners. Greenish blue. 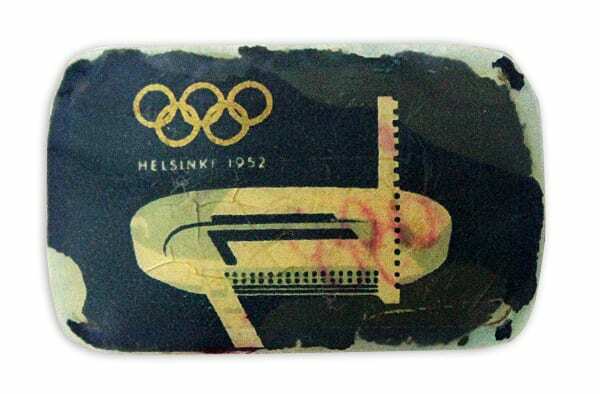 The Olympic Stadium, the Olympic rings and the text HELSINKI 1952 in gold colour. Other information: Belonged to the outfit of Olympic youth volunteers. The outfit including shirt, shorts (or skirt for girls), leather belt, hat, pocket badge and blue-and-white sneaker shoes. The volunteers paid 1,600 Fmk for the outfit. This was half of the actual price, the other half being paid by the Organising Committee.